The 2018 NHL Awards will air live on June 20 from the Hard Rock Hotel and Casino on NBCSN and Sportsnet at 5pm PT/8pm ET. Las Vegas has hosted the show several times. I'm working as a Stand In again this year for some of the presenters and nominees. I can't believe it was only a year ago that Las Vegas created our new team, the Las Vegas Golden Knights by way of the NHL Expansion Draft, which was televised live during the 2017 NHL Awards. It made the show especially exciting to be a part of. Little did we know then that our new team would go all the way to the Stanley Cup Finals their first year and become the most successful expansion team in the history of professional sports! Of the 12 NHL Awards being presented, four VGK Members are nominated. These include Players William Karlsson and Deryk Engelland, Coach Gerard Gallant and General Manager George McPhee. Let's hope all of them have an NHL Award to add to their accomplishments this past season! Many of us here in Las Vegas will always appreciate the National Hockey League for allowing us to have our first Major League Sports Team. It's been a wonderful addition to our city and has bonded our community in ways we didn't imagine a year ago. There's another element that's brand new to the NHL Awards this year. The Inaugural NHL Gaming World Championship which was held earlier tonight at the new 30,000 square foot Allied ESports Arena at the Luxor Hotel and Casino here in Las Vegas. The winner was Erik Tammenpaa from Finland who was awarded the $50,000 prize after defeating United States player David Roebuck in a best-of-3 final. 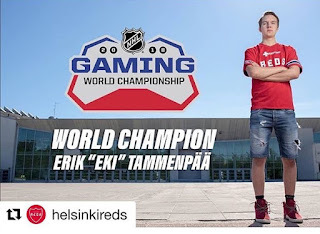 For those who may not know what this event is about, it's an NHL ESports Championship where players compete against others from all over the world in hockey video gaming in front of an audience of international fans.